Clear + Brilliant — Jordana Gilman, M.D. Clear + Brilliant is a unique treatment that uses safe fractional laser technology to prevent and address early signs of aging skin. Clear + Brilliant is a gentle laser that refreshes skin from the inside out. The laser energy creates millions of microscopic treatment zones in your skin, replacing damaged skin with healthy, younger looking tissue. No matter how old you are, sun exposure, environmental conditions, and lifestyle can contribute to lackluster skin. Whether you want to extend the younger look of your skin or want to address early signs of aging, Clear + Brilliant can help. I have had corrective laser treatments before, is Clear + Brilliant right for me, too? The number of treatments is tailored to your concerns and skin care desired. Many people see better looking skin after only one treatment, and most people elect for a series of four monthly treatments. The results of the treatment are both immediate and progressive. A few days after treatment your skin will start to feel softer, look brighter, and show more even skin tone. Results can last for months depending on your age, skin condition, and how you care for your skin. Results are cumulative and longer lasting after multiple treatments. What will I look like after the treatment? Can I go back to work? 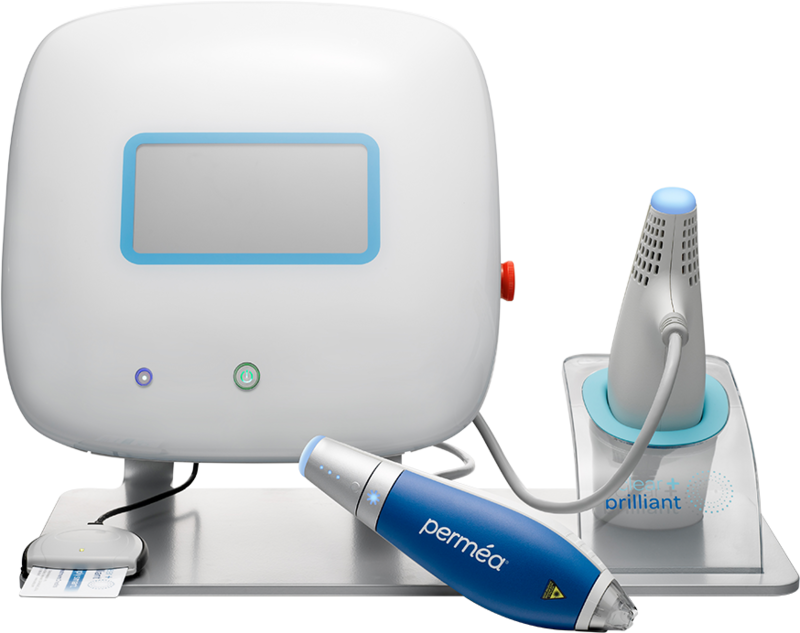 Clear + Brilliant treatments are very gently and designed to minimize the side effects of other laser treatments. You may have some redness and slight swelling right after treatment, which usually resolves within a few hours. You will be able to wear makeup the next day. What does Clear + Brilliant treatment feel like? Most patients describe the Clear + Brilliant treatment like a sensation of heat and/or a cat’s tongue. We will apply a topical numbing cream for 45 minutes before your treatment which helps minimize the discomfort. We also ice the skin after the treatment, to help minimize redness and inflammation.